According to The Pulse Of Radio, Robert Plant remains one of Jimmy Page's most ardent supporters despite a definite disagreement over another LED ZEPPELIN reunion. While publicizing his new solo album with the SENSATIONAL SPACE SHIFTERS — "Lullaby And… The Ceaseless Roar", Plant spoke to The Telegraph and touched upon Page's infamous inability at releasing new music, saying, "He should get on and do something, he's a superb talent. That's the sad thing for Jimmy, he knows that I'm his guy, I'm his pal, but the warmth that he needs to actually enjoy the world, it's all there. Come on and give it to us." As far as his own talents as a frontman, Plant said: "There are only three or four frontmen left, from our time, who actually just kick the mic stand up and do it, and that's me, Rod Stewart, and Mick Jagger. But the only important thing is, can you contemporize your gift? Can I knock myself out, or am I just going through the motions? Because if I'm going through the motions, I'm fucked." 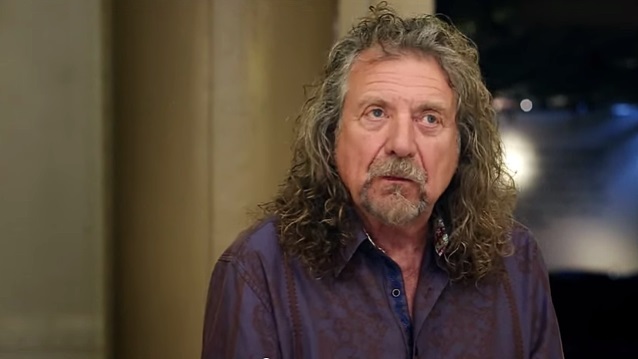 Plant remains respectful of his accomplishments with Jimmy Page and LED ZEPPELIN. "I had no history to speak of, really, before I met Jimmy," he said. "I hadn't stepped into my physical personality. In ZEPPELIN, I learned how to apply myself, how to express myself as a writer, how to shut up and listen. So I grew, I got some of my chops." During LED ZEPPELIN's 2012 New York City press conference to publicize "Celebration Day", Robert Plant admitted that the pressure of making music under the LED ZEPPELIN moniker is tremendous. "I think expectations are horrific things," he said. "I mean, if you go off and play in North Africa, or something like that, you just, you know you're going to have a good time and you're going to work with people and there's nothing else about it. That's how we started, in a little room with Jason's [Bonham] dad [John Bonham, late LED ZEPPELIN drummer] all that time ago. So, to actually, to do anything at all together is such a kind of incredible weight, because I think we were really propelled by Jason [who played drums at ZEPPELIN's 2007 reunion show] and his enthusiasm."